Gather around professionals because tonight we share our hair raising stories about terrifying past business experiences while we share a drink with the ghost of “Mrs. M”* at the Albuquerque Press Club. 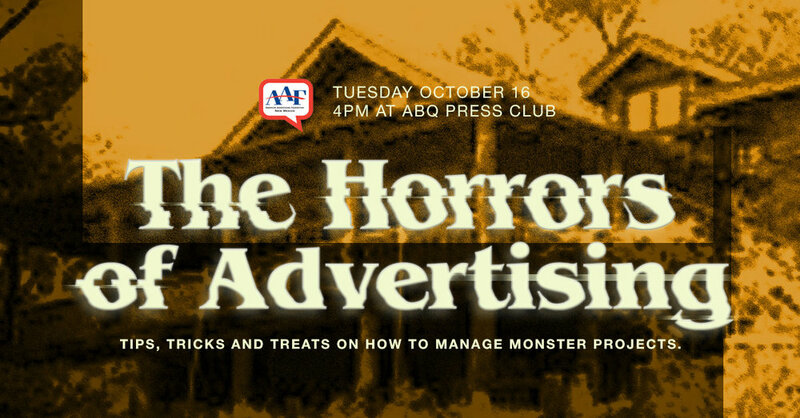 Throughout this evening, local businesses are invited to tell their chilling tales before we hear from our guest speaker Elisa Valdez from LAVU about how to Manage Monster Projects. After our guest speaker hear ghost stories from Blake, the ghostly guide of the 2018 ABQ Trolley Co. Trolley of Terror. Each guest will receive a free drink coupon and entry into our raffle. We will be giving prizes away to anyone willing to share their most frightening experience with us. Are you facing an enormous project? Does the idea of starting on a giant project chill you to the bone? Tonight our guest speaker Elisa Valdez from LAVU, will discuss the best way to take on monster projects. In her talk, she will give helpful tips about time management, how to breakdown goals and provide tools and resources to make large projects more approachable. Elisa Valdez is an Albuquerque native who began her career working in advertising, marketing and print design. In 2012, she started a local marketing and design agency called The IDEA State, whose mission was to bring big design to small businesses. In addition to running her own agency, Elisa has also been an educator at the Southwest University of Visual Arts and a Multimedia Designer at Northrop Grumman Co.
For over 3 years with Lavu, Elisa has built and lead the company’s first front end development and product design teams, aided in redesigning and architecting the company’s product offerings and in the the engineering of Lavu’s new web and mobile based applications. Her current role is a Software Developer on the mobile application team. In her free time she teaches at Girl Develop It, privately and at UNM CE. Elisa also contracts for various local companies helping with branding, product design and software/web development. *At the Press Club the ghost of a woman in a black shawl is said to haunt the bar area. Regulars call her “Mrs. M” People have heard the sound of high heels on the floor and claim the piano often plays a few notes independently of any living hand. Everything you wanted to know about Marketing and Advertising but was afraid to ask.